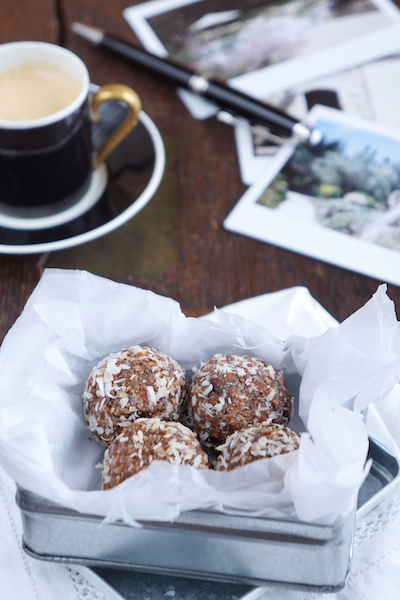 Coco Choco Chia Energy Balls could become one of your favourite snacks! 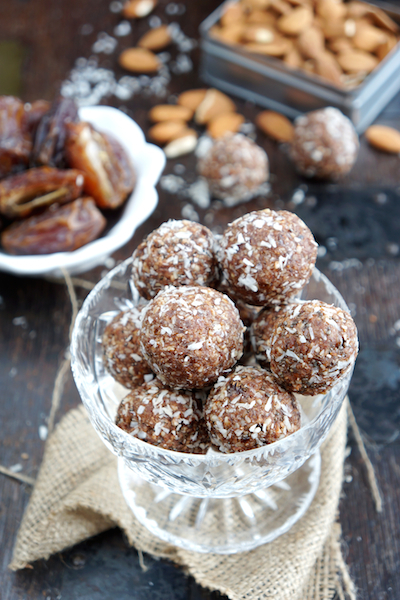 They are delicious, easy to prepare and healthy, they satisfy those sugar cravings and give you the energy you need when feeling flat or after a long work out, so make sure you keep a supply handy! “Too good to be true”? Not this time!!! Blend the almonds and coconut in a food processor until roughly ground (∼15 sec). Add the maple syrup, almond butter, and raw cacao powder. Blend until combined (∼10 sec). 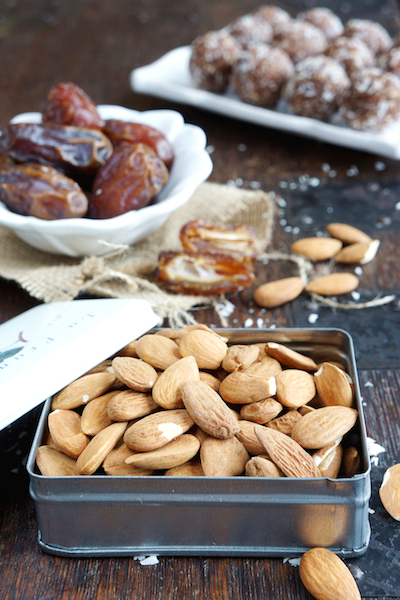 Add the pitted dates and process until perfectly combined (no more date chunks visible, ∼20-30 sec). Add the chia seeds and stir (don’t blend, we like them whole). Create walnut sized balls by crunching the mix in your hands (wet your hands if you’re having trouble sticking them together). Coat with the 3 tbsp of desiccated coconut. 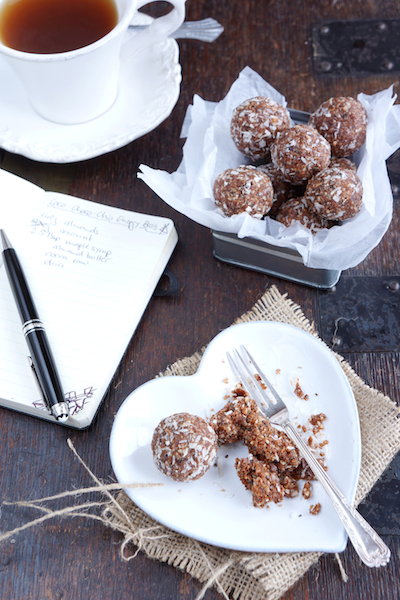 CCC Energy Balls will keep for 2 weeks in the fridge, you can even freeze them! Add more raw cacao powder for a more dark-chocolate-like flavour. 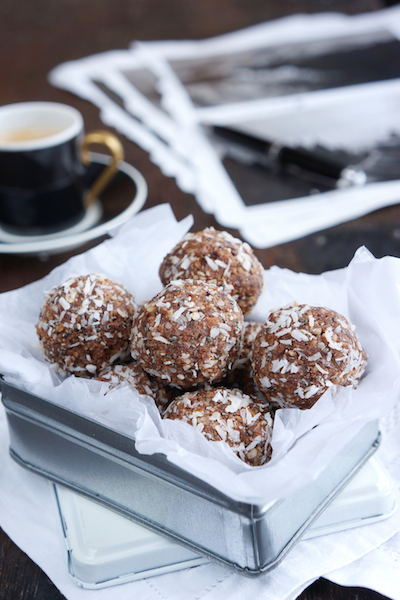 The recipe works just as well without chia seeds. Use alternative coatings such as raw cacao powder or chopped goji berries. Expectant mothers…this is for you! 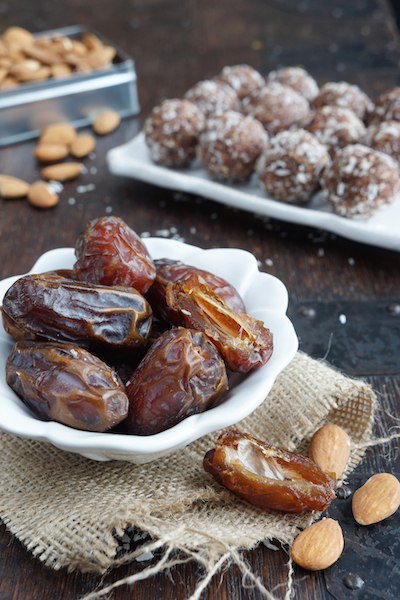 A study published in 2011 suggested that eating dates 4 weeks prior to giving birth had the following benefits: significantly higher cervical dilation; reduced need for induction and reduced infection rate as a result of a higher rate of intact membranes on admission to hospital. This entry was posted in Food, Food Photography, Food Styling, Health, Recipes and tagged photography, raw, vegan, vegetarian by Françoise La Prune. Bookmark the permalink.